Filled with twists and turns, quips and enough bad-assery (is that a word? I'm making it a word.) 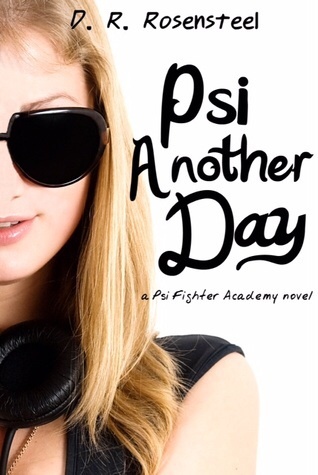 to entertain the masses, Psi Another Day is a great read that left me laughing to the last page. Like many superheroes, Rinnie is an orphan, an average teen who goes to school, gets bullied for not being popular, and believes that dodge ball was created by someone with great evil intent. By night, she wears a costume and fights crime. "My name is Rinnie Noelle. I'm a Psi Fighter. We protect the innocent, kind of like Batman. But we don't do capes. Capes are for weirdos." With her best friend Katherine, high school isn't too bad. As sarcastically funny as Rinnie, Katherine is everything a BFF should be. Katherine: "Poor guy just took a hard right on Batty Boulevard." Then there's Andy, who constantly had me chuckling. He's Rinnie's fighting partner and trainer when it comes to the Psi world. "Andy hit a button on his chest armor and the theme song from the Addams Family played softly in the background. I did a mental eye roll. I could always predict the weirdness of the lesson by the music Andy selected." All this, along with many of the other characters introduced throughout the book, made this an awesome read. Enough intrigue and second guessing bad guys til the very end. I can't wait til the next book. "Memory transfer by noogie," Andy said, "Happens all the time."